What an interesting summer it has been. There have been a number of famous people die (the most recent being guitar legend and innovator Les Paul). In my family we’ve had some special occasions, including our daughter getting married. Plus, there have been lots of birthday celebrations and other family events. Life is busy – and full. Another milestone anniversary is also taking place. This weekend is the 40th anniversary of the Woodstock Music and Art Fair. 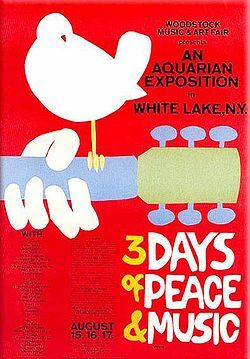 This three-day event on a farm in upstate New York in 1969 rocked (literally) the world. It influenced our culture, our values and our music for a whole generation. This month I write about it. In August of 1969 hundreds of thousands of young people from around the United States arrived in upstate New York for an event that defined a generation. The Woodstock Music and Art Fair, billed as 3 days of peace and music, was that – and much more. August 15, 16, and 17 were the dates, but it spilled into the 18th when Hendrix woke everybody up Monday morning with his amazing set. Now it is 40 years later and the world is looking back and remembering Woodstock. The idea of a festival near Woodstock, New York came about because of a few young men, two who were especially influential, Michael Lang and Artie Kornfield. The area was already home, at least part of the time, to some popular musicians like Bob Dylan, Janis Joplin, Blood, Sweat & Tears and The Band. The history has been chronicled quite well in Woodstock: The Oral History by Joel Makower (available from SUNY Press). Max Yasgur, a local farmer in Bethel, NY, was convinced to lend his land for the event. Nobody expected half a million people, but despite the huge crowds and logistical challenges – not to mention all the rain – the event was a celebration of love and peace. Yes, plenty of drug use, like LSD, but most people didn’t know too much about the dangers of that back then. I, like many others, eventually discovered that you don’t need to get high to get the benefit of a spiritual awakening that something like Woodstock delivered. What happened in August of 1969 was truly revolutionary. The music and the coming together of so many people launched what became known as the Woodstock Generation. I was too young – thirteen – to be much influenced at the time. But in just a few years I was in High School and groovin’ to the explosion of rock music. I vividely remember the first time I saw the Academy Award winning documentary. It made me feel like I was there. Many of the acts at Woodstock became important to me. The Grateful Dead, Creedence Clearwater Revival, The Who, Jimi Hendrix, Janis Joplin, Arlo Guthrie, Joe Cocker, Santana, Jefferson Airplane – these and others were pivotal artists and I continue to cherish and enjoy their music. Over the years I’ve met many people who claim to have been at the Woodstock Festival. Some of them probably really were there. One of them is a friend who told me he was nearly 16 at the time, living in Connecticut and playing in a rock band. He convinced his mom to drive him and his band mates to the festival and she did. Amazingly, she even came back and picked them up afterwards. Barry has lots of stories about that experience. Others have their memories and stories. You can read some of them at woodstockstory.com . The site has a wealth of information about the Woodstock anniversary, original festival, other similar gatherings and more. There is even information about Artie Kornfield’s soon-to-be-released memoir, The Pied Piper of Woodstock (more here). A fellow radio broadcaster I know here in Albuquerque also put together a great radio special that has been airing nationally on public radio stations. Paul Ingles produced Back to the Garden: Woodstock Remembered and you can find out more about it, even listen online, here. I also recommend seeing the AARP slideshow featuring commentary from Paul and wonderful pictures from the 1969 Woodstock event. The influence of the Woodstock generation carries on. I’ve always felt that music is a universal language and the message of peace, love and understanding is essential for our world and our lives. There are many ways to capture your life story. Your Life Is Your Story can show you how to use different means, such as the MemoryGrabber, MemoryPress, Priceless Legacy Company, Journal Software as well as recommended books about memoir and writing your life story. Check out these family and personal history/life story services and I look forward to working with you to capture your life story.